A new image from the Hubble Space Telescope shows the butterfly-shaped cloud of glowing gas and dust that is the wreckage of a star similar to the Sun. Fluorescent lights on Earth get their bright colors from the gases they are filled with. Neon signs, famously, produce a bright red color, while ultraviolet lights (black lights) typically contain mercury. 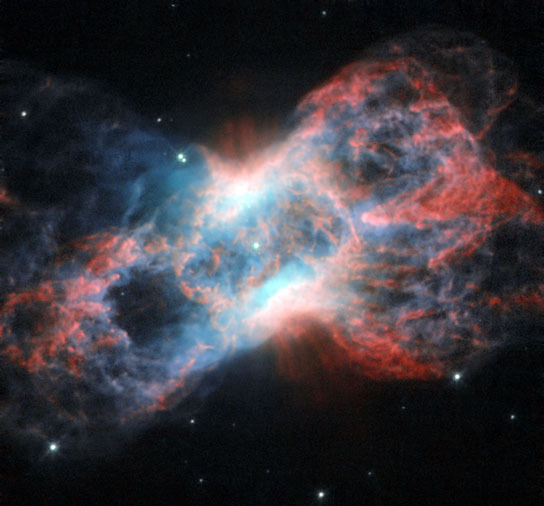 The same goes for nebulae: their vivid colors are produced by the mix of gases present in them. This image of NGC 7026 shows starlight in green, light from glowing nitrogen gas in red, and light from oxygen in blue (in reality, this appears green, but the color in this image has been shifted to increase the contrast). A version of this image was entered into the Hubble’s Hidden Treasures Competition by contestant Linda Morgan-O’Connor. Hidden Treasures is an initiative to invite astronomy enthusiasts to search the Hubble archive for stunning images that have never been seen by the general public. Be the first to comment on "Hubble Views Planetary Nebula NGC 7026"